Welcome to PCI Compliance Guide. Click on the links below to find answers to frequently asked questions. Q3: Where can I find the PCI Data Security Standard (PCI DSS)? Q4: What are the PCI compliance ‘levels’ and how are they determined? Q5: What does a small-to-medium sized business (Level 4 merchant) have to do in order to satisfy the PCI DSS requirements? Q6: How does taking credit cards by phone work with PCI? Q7: If I only accept credit cards over the phone, does PCI DSS still apply to me? Q8: Do organizations using third-party processors have to be PCI DSS compliant? Q9: My business has multiple locations, is each location required to validate PCI compliance? Q10: We only do e-commerce. Which SAQ should we use? Q11: My company doesn’t store credit card data so PCI compliance doesn’t apply to us, right? Q12: Are debit card transactions in scope for PCI? Q13: Am I PCI compliant if I have an SSL certificate? Q14: My company wants to store credit card data. What methods can we use? Q15: What are the penalties for non-compliance? Q16: What is defined as ‘cardholder data’? Q17: What is the definition of ‘merchant’? Q18: What constitutes a Service Provider? Q19: What constitutes a payment application? Q20: What is a payment gateway? Q22: Can the full credit card number be printed on the consumer’s copy of the receipt? Q23: Do I need vulnerability scanning to validate compliance? Q24: What is a vulnerability scan? Q25: How often do I have to have a vulnerability scan? Q26: What if my business refuses to cooperate? Q27: If I’m running a business from my home, am I a serious target for hackers? Q28: What should I do if I’m compromised? Q29: Do states have laws requiring data breach notifications to the affected parties? The Payment Card Industry Security Standards Council (PCI SSC) was launched on September 7, 2006 to manage the ongoing evolution of the Payment Card Industry (PCI) security standards with a focus on improving payment account security throughout the transaction process. The PCI DSS is administered and managed by the PCI SSC (www.pcisecuritystandards.org), an independent body that was created by the major payment card brands (Visa, MasterCard, American Express, Discover and JCB.). It is important to note that the payment brands and acquirers are responsible for enforcing compliance, not the PCI council. A copy of the PCI DSS is available here. A: The current PCI DSS documents can be found on the PCI Security Standards Council website. Complete the self-assessment Questionnaire according to the instructions it contains. Complete and obtain evidence of a passing vulnerability scan with a PCI SSC Approved Scanning Vendor (ASV). Note scanning does not apply to all merchants. It is required for SAQ A-EP, SAQ B-IP, SAQ C, SAQ D-Merchant and SAQ D-Service Provider. A: The following post, “How Does Taking Credit Cards by Phone Work with PCI?” explains your PCI compliance responsibilities when taking credit card information over the phone (e.g., in a call center). Note that while this post was published in 2014, it is still relevant with the current version of the PCI DSS. A: Yes. Merely using a third-party company does not exclude a company from PCI DSS compliance. It may cut down on their risk exposure and consequently reduce the effort to validate compliance. However, it does not mean they can ignore the PCI DSS. A: If your business locations process under the same Tax ID, then typically you are only required to validate once annually for all locations. And, submit quarterly passing network scans by an PCI SSC Approved Scanning Vendor (ASV) for each location, if applicable. A: It depends on how your shopping cart is set up. See PCI SAQ 3.1: E-Commerce Options Explained. A: If you accept credit or debit cards as a form of payment, then PCI compliance applies to you. The storage of card data is risky, so if you don’t store card data, then becoming secure and compliant may be easier. A: In-scope cards include any debit, credit, and pre-paid cards branded with one of the five card association/brand logos that participate in the PCI SSC – American Express, Discover, JCB, MasterCard, and Visa International. A: Most merchants that need to store credit card data are doing it for recurring billing. The best way to store credit card data for recurring billing is by utilizing a third party credit card vault and tokenization provider. By utilizing a vault, the card data is removed from your possession and you are given back a “token” that can be used for the purpose of recurring billing. By using a third party, you move the risk of storing card data to someone who specializes in doing that and has all of the security controls in place to keep the card data safe. If you need to store the card data yourself, your bar for self-assessment is very high and you may need to have a QSA (Qualified Security Assessor) come onsite and perform an audit to ensure that you have all of the controls in place necessary to meet the PCI DSS specifications. A: The payment brands may, at their discretion, fine an acquiring bank $5,000 to $100,000 per month for PCI compliance violations. The banks will most likely pass this fine along until it eventually hits the merchant. Furthermore, the bank will also most likely either terminate your relationship or increase transaction fees. Penalties are not openly discussed nor widely publicized, but they can be catastrophic to a small business. It is important to be familiar with your merchant account agreement, which should outline your exposure. Sensitive Authentication Data, which must also be protected, includes full magnetic stripe data, CAV2, CVC2, CVV2, CID, PINs, PIN blocks and more. A: What constitutes a payment application as it relates to PCI compliance? 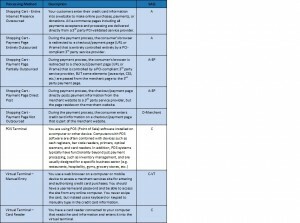 The term payment application has a very broad meaning in PCI. A payment application is anything that stores, processes, or transmits card data electronically. This means that anything from a Point of Sale system (e.g., Verifone swipe terminals, ALOHA terminals, etc.) in a restaurant to a Website e-commerce shopping cart (e.g., CreLoaded, osCommerce, etc) are all classified as payment applications. Therefore any piece of software that has been designed to touch credit card data is considered a payment application. A: Payment gateways connect a merchant to the bank or processor that is acting as the front-end connection to the card brands. They are called gateways because they take many inputs from a variety of different applications and route those inputs to the appropriate bank or processor. Gateways communicate with the bank or processor using dial-up connections, web-based connections or privately held leased lines. A: PA-DSS refers to Payment Application Data Security Standard maintained by the PCI Security Standards Council (SSC) to address the critical issue of payment application security. The requirements within the PA-DSS are designed to ensure that vendors provide products which support merchants’ efforts to maintain PCI DSS compliance and eliminate the storage of sensitive cardholder data. The PCI SSC administers the program to validate payment applications’ compliance against the PA-DSS, and publishes and maintains a list of PA-DSS validated applications. 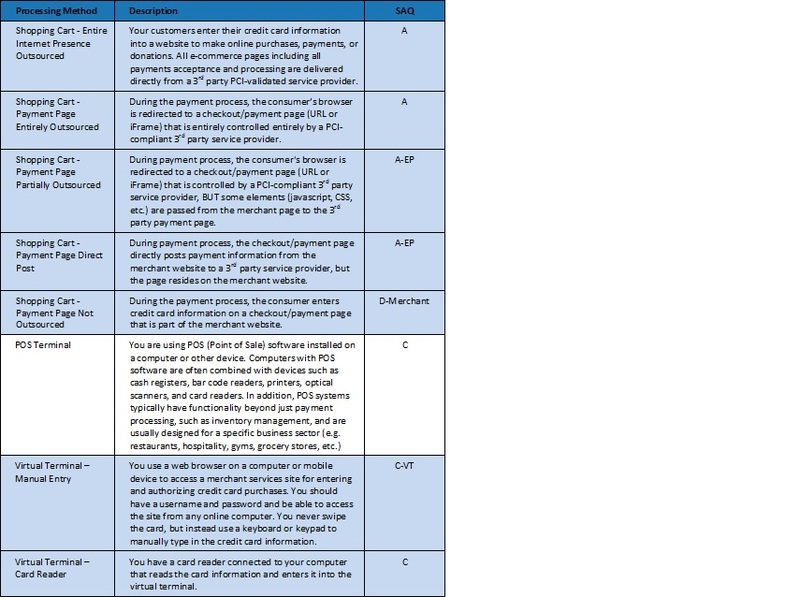 See PCI Security Standards for more information. Also see our blog post on the critical difference between the PCI DSS and PA-DSS here. A: PCI DSS requirement 3.3 states “Mask PAN when displayed (the first six and last four digits are the maximum number of digits to be displayed).” While the requirement does not prohibit printing of the full card number or expiry date on receipts (either the merchant copy or the consumer copy), please note that PCI DSS does not override any other laws that legislate what can be printed on receipts (such as the U.S. Fair and Accurate Credit Transactions Act (FACTA) or any other applicable laws). A: A vulnerability scan involves an automated tool that checks a merchant or service provider’s systems for vulnerabilities. The tool will conduct a non-intrusive scan to remotely review networks and web applications based on the external-facing Internet protocol (IP) addresses provided by the merchant or service provider. The scan identifies vulnerabilities in operating systems, services and devices that could be used by hackers to target the company’s private network. As provided by an Approved Scanning Vendors (ASV’s) such as ControlScan, the scan does not require the merchant or service provider to install any software on their systems, and no denial-of-service attacks will be performed. Learn more about vulnerability scans here. A: Every 90 days/once per quarter, those who fit the above criteria are required to submit a passing scan. Merchants and service providers should submit compliance documentation (successful scan reports) according to the timetable determined by their acquirer. Scans must be conducted by a PCI SSC Approved Scanning Vendor (ASV) such as ControlScan. A: PCI is not, in itself, a law. The standard was created by the major card brands Visa, MasterCard, Discover, AMEX and JCB. At their acquirers’/service providers’ discretion, merchants that do not comply with PCI DSS may be subject to fines, card replacement costs, costly forensic audits, brand damage, etc., should a breach event occur. For a little upfront effort and cost to comply with the PCI DSS, you greatly help reduce your risk from facing these extremely unpleasant and costly consequences. Learn how ControlScan helps simplify PCI DSS. A: Yes. Home users are arguably the most vulnerable simply because they are usually not well protected. Adopting a ‘path of least resistance’ model, intruders will often zero—in on home users—often exploiting their always-on broadband connections and typical home use programs such as chat, Internet games and P2P file sharing applications. ControlScan’s scanning service allows home users and network administrators alike to identify and fix any security vulnerabilities on their desktop or laptop computers. A: While many payment card data breaches are easily preventable, they can and do still happen to businesses of all sizes. A: Absolutely. California is the catalyst for reporting data breaches to affected parties. The state implemented its breach notification law in 2003, and now nearly every state has a similar law in place. As of April 12, 2017, NCSL.org reports: Forty-eight states, the District of Columbia, Guam, Puerto Rico and the Virgin Islands have enacted legislation requiring private, governmental or educational entities to notify individuals of security breaches of information involving personally identifiable information.